Ring Video Doorbells come in a range of sizes ranging from the slightly larger original Ring Video Doorbell (which contains its own battery) to the sleek Elite (which is wired to an existing power supply). The following chart lists the dimensions of our product line. The Ring Referral program is a way for our Ring neighbors to help protect their friends, neighbors and loved ones by having them download the free Ring app and sign up for a free Ring.com account. 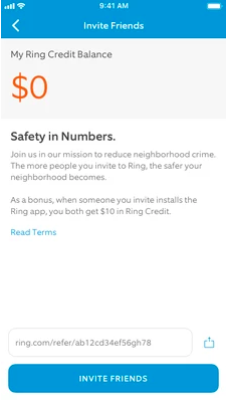 Neighbors who download the Ring app and sign up for a Ring.com account are (once verified) eligible for entry into the free Ring Neighborhoods program and, in addition, both you and the person you refer will receive a $10 credit good for any product on Ring.com! Inviting someone to the Ring Referral program is as easy as tapping the "Invite Friends" in the side menu or "Invite Now" in your Neighborhood Feed. 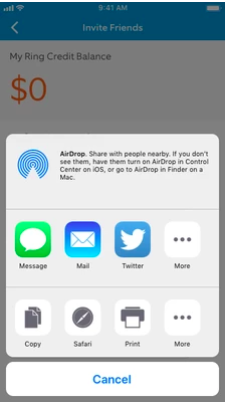 This will open a page where you can use your smartphone's messaging utilities to send out an invitation. 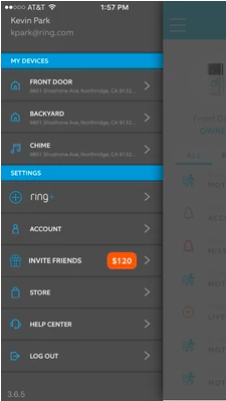 Once the person you refer downloads the Ring app, creates a Ring.com account and is verified, we'll credit you both with a $10 credit good for any camera or doorbell or accessory on Ring.com!